In 1973 when the Commonwealth Parliament amended the Electoral Act 1918 to lower the minimum voting age to eighteen, Vicki Bourne was a nineteen-year-old student. Inspired by the opportunity to vote, she looked at the environmental policies of each of the major political parties, rejecting the major parties in favour of the Australia Party. In 1977, when the Australia Party was merging with the New Liberal Movement to form a new political party called the Australian Democrats, Bourne decided to attend a meeting at the Sydney Town Hall to get involved in the emerging political movement. She was drawn to the new party, led by the former Liberal senator Don Chipp, as she liked his vision of a party that stood for honesty, tolerance and compassion and she felt that joining the Democrats would be the best means by which she could pursue her two main political concerns: protecting the environment and promoting basic human rights. Victoria (Vicki) Worrall Bourne was born in Sydney on 22 October 1954, one of four children of Victor Joseph Bourne, a fitter, and his wife Hazel Grace, née Simpson. She attended Fort Street Girls' High School, a selective school in Sydney, and the University of New South Wales, from which she graduated as a Bachelor of Science (Architecture) and then a Master of Science (Acoustics). In 1977 Bourne became a founding member of the Australian Democrats and was actively involved in the election campaign of Colin Mason, who was elected as the first Australian Democrats senator for New South Wales. She became Mason's parliamentary research officer and private secretary after he had taken his place in the Senate in July 1978. 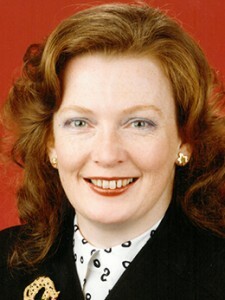 Following Mason's resignation in 1987 Bourne moved to the office of Australian Democrats Senator Paul McLean for whom she worked as a parliamentary research officer until January 1990. At the March 1990 federal election Bourne was chosen to head the Australian Democrats' NSW Senate ticket. After having campaigned on a platform of environmental concerns, human rights and social justice she became the fifth of six senators elected. She took her place in the Senate on 1 July 1990, joining seven other Democrats senators. She was re-elected in 1996. On 22 August 1990, in her first speech, Bourne expressed pride in belonging to a party with a healthy female representation—four of the eight Democrats senators were women. She went on to argue the need for Australia to increase its use of and investment in renewable energy sources and she spoke about the need to conserve the natural environment: 'The earth is an intricate and precariously balanced network, and we must stop playing with it'. Finally, Bourne, foreshadowing issues for which she would continue to campaign throughout her parliamentary career, stressed that Australians needed to remember that their country had an obligation to do everything in its power to alleviate the suffering associated with poverty, human rights abuses and war, on both a domestic and international front. Bourne was very active in the Senate, serving as party Whip from 1991 to 2002 and interim Deputy Leader of the Democrats for the brief period between October and December 1997. As with other Democrats senators, upon taking her seat Bourne was allotted a number of portfolios, including foreign affairs and two years later, human rights and overseas development. She was also a member of numerous Senate and joint committees, serving on both the Senate Standing Committee on Foreign Affairs, Defence and Trade and the Joint Standing Committee on Foreign Affairs, Defence and Trade. Bourne campaigned tirelessly for the rights of Tibetan citizens and for Tibetan independence. In December 1990 she moved a motion protesting China's record of human rights violations in Tibet. Speaking after the Senate had unanimously passed the motion, she remarked that the passing of the motion provided 'a very good example of the consultation and cooperation which is often a welcome feature of the Senate's work but which generally goes unreported because ... it does not entertain in the way conflict does'. Bourne was also a member of the first Australian human rights delegation to visit China in July 1991. The visit confirmed her view 'that the human rights situation in Tibet in particular leaves much to be desired', and she found Tibet to be 'the saddest place' that she had ever visited. Bourne was a strong and persistent advocate for the independence of East Timor from 1978, well before she was elected to Parliament. As a senator she was a member of three official delegations to East Timor including the official observer delegation to the 2002 presidential election. On more than one occasion she voiced allegations of atrocities perpetrated in the region and called for a parliamentary inquiry into the deaths of Australian journalists at Balibo. After independence, she showed her commitment to the people of East Timor by arguing that the newly-formed country should receive a much greater share of the revenue in any agreement that superseded the Timor Gap Treaty. Her dedication to the country was recognised by her peers through her appointment as the inaugural chair of the Australia-East Timor Parliamentary Friendship Group. Bourne repeatedly called for the observance of and respect for the International Declaration of Human Rights, campaigning for the recognition of a Kurdish state, for restoration of democracy in Burma and for the humane treatment of asylum seekers in Australia. In 2000, she challenged the Howard-led Coalition Government to take a progressive stand on human rights, by linking human rights and trade, and introduced a private senator's bill, the Corporate Code of Conduct Bill, to regulate Australian companies overseas in the area of human rights, the environment, labour and occupational health and safety. However, the bill lapsed. Bourne took an active interest in Australia's involvement in conflicts overseas. In October 1990—two months after Iraq had invaded Kuwait, with a wider conflict looming—she moved an amendment to the Defence Legislation Amendment Bill: 'to ensure that Australian troops cannot be sent overseas to fight or to act as peacekeepers without the agreement of both Houses of Federal Parliament'. In justifying her proposed amendment, which was not agreed to, she pointed to the Vietnam War as 'the obvious example of a disastrous decision to send Australian troops overseas ... with no proper consultation of the Parliament or the people'. Bourne also used her parliamentary position to help promote effective conflict resolution. In her own words, one of her major parliamentary achievements was that she 'Convinced the Australian foreign minister [Senator Gareth Evans to ask the Papua New Guinean prime minister to allow an Australian parliamentary delegation to his country, and that delegation acted as a catalyst for peace'. The delegation's report resulted in the establishment of the South Pacific Peace Keeping Force, in October 1994, and was described by Evans as 'unusually important' in encouraging a peaceful solution to the fierce conflict that had been waged over the preceding four years between the Bougainville Revolutionary Army and the PNG Government. In 1999, as a member of a Joint Standing Committee on Foreign Affairs, Defence and Trade delegation, Bourne again visited Bougainville and was able to personally see how far the peace process had come, noting that she was able to see 'a very genuine commitment to peace on all sides'. Bourne was not only active on issues affecting Australia's foreign affairs; she also made some important contributions to Senate procedure. In 1994 Bourne successfully moved for the Procedure Committee to inquire and report on ways that the committee system could be made more responsive to the composition of the Senate. As a result of this inquiry, significant long-term changes were made to the Senate committee system. The estimates committees were amalgamated with the legislative and general purpose committees to establish standing committee pairs, composed of a legislation committee and a references committee, each with overlapping membership and a shared secretariat. Arrangements for chairing committees were also affected, with legislation committees being chaired by government members and references committees chaired by non-government members. In the same year Bourne and her fellow Democrats pushed for the introduction of 'participating' members into the committee system—participating members having all the rights of other committee members, except the right to vote—thus allowing more senators, especially those from minor parties, to be involved in committee work. Later, after she had left the Senate, when asked about her greatest achievement in the Senate she expressed great pride in the role she played in introducing these fundamental changes to the Senate committee system. The tabling of thirty-six different treaties on 30 November 1994 led to a debate about whether there was a need to put in place a formal means of scrutinising treaties in the Senate. Earlier that year Bourne had introduced a private senator's bill, the Parliamentary Approval of Treaties Bill, which would have allowed a treaty to enter into force in Australia only if it had been tabled in each House of Parliament and each House had, formally or by implication, consented to the treaty. The bill remained at the second reading stage until Bourne introduced a revised version in May 1995. In her second reading speech on the revised bill she argued that parliamentary scrutiny of treaties could be described as 'too little, too late'. She asserted: 'It is a fundamental democratic principle that an executive government should seek parliamentary approval before making a treaty binding on Australia'. Although restored to the Notice Paper in 1996, 1998 and 2002, the revised bill was never passed. Given the lack of obvious support for her bill, in 1995 Bourne put forward an alternative suggestion that would have established 'a stream-lined process for referring proposed treaties to Senate committees for scrutiny' through the Selection of Bills Committee. In November of the same year the Legal and Constitutional Affairs References Committee published a report Trick or Treaty? Commonwealth Power to Make and Implement Treaties, examining the various options available to the Senate to scrutinise treaties. Upon its election in 1996, the Howard Government responded favourably to the committee's recommendations, agreeing to table treaties in each House before ratification, to establish a treaties council to allow for consultation with the states, and to set up the Joint Standing Committee on Treaties. Bourne served on the new committee for the remainder of her Senate career. For a large part of her time in the Senate Bourne was the Democrats spokesperson on communications and broadcasting. She was passionate about the protection of public broadcasting and wished to encourage increased diversity and local content on television. She also debated media cross-ownership laws and questions around the introduction of pay television and digital television. She was a resolute and persistent advocate for the independence of the Australian Broadcasting Corporation, arguing that funding cuts threatened this independence. Furthermore, at a time when digital media was embryonic, Bourne advocated that the principles of fairness and universal access, not just commercial interests, should drive new media policy. Over her twelve years in the Senate Bourne was unwavering in her convictions, but her strength lay in being a very capable negotiator who enjoyed discussing and debating issues and reaching agreement on the process as well as the policy. Liked and respected by fellow senators, Bourne remained on good terms with all except one. For two years she refrained from speaking to Senator Faulkner (ALP, NSW) on account of his role in the defection of the Democrats' leader, Cheryl Kernot, to Labor in 1997. Faulkner formally apologised for his actions during valedictory speeches when Bourne left the Senate. Bourne contested the November 2001 federal election. Although she secured 70 000 more primary votes than the Australian Greens candidate Kerry Nettle, Nettle won the final NSW Senate seat with the help of preferences from the One Nation party. During valedictories, the Leader of the Australian Democrats, Senator Stott Despoja (SA), described Bourne as 'a great believer in democracy' and observed that it was 'a tragic irony that, in an election campaign that was dominated by international conflict and the issue of asylum seekers, the only seat lost [by the Democrats] in the Senate belonged to the parliament's longest serving campaigner on the issue of human rights, particularly on an international level'. In her final speech to the Senate, in June 2002, Bourne said 'I am so proud to have served in this Senate. This place we are in is responsible for the transparency and the accountability that comes out of this parliament'. Jenny Hutchison, Transcript, 'Ring the Bells', ABC Radio, 27 April 1990; CPD, 27 June 2002, pp. 2871–4, 2913–7; Australian Democrats, 30 Years, Australian Democrats, East Melb., Vic., 2007, pp. 32–33. CPD, 22 Aug. 1990, pp. 1999–2002. CPD, 6 Dec. 1990, pp. 5078–9, 5113–4, 9 Sept. 1991, pp. 1258–62, 19 June 2002, pp. 2203–5, 27 June 2002, pp. 2913–7; Media Release, Vicki Bourne, 17 Aug. 1995, 6 Feb. 1997, 28 April 1997; CPD, 16 March 2000, pp. 13006–7, 4 Oct. 2000, p. 17836; Media Release, Vicki Bourne, 26 Oct. 1995, 9 Oct. 2000; CT, 10 Aug. 1994, p. 4, 24 Sept. 1999, p. 6; CPD, 11 April 1991, p. 2385–8, 31 March 1999, p. 3629, 19 March 2002, p. 979, 18 June 2001, pp. 24476–7; CT, 26 April 1991, p. 7; Australian (Syd. ), 19 June 2001, p. 1; CPD, 6 Sept. 2000, pp. 17457–61, 28 June 2001, pp. 25323–5. CPD, 9 Oct. 1990, pp. 2730–7, 8 June 1994, pp. 1473–8, 1478–81, 31 March 1999, pp. 3644–6; 30 Years, Australian Democrats, pp. 32–33. CPD, 1 Feb. 1994, p. 58, 24 Aug. 1994, pp. 166–8, 171–2; Procedure Committee, First Report of 1994, Canberra, 1994; Harry Evans & Rosemary Laing (eds), Odgers' Australian Senate Practice, 13th ed., Department of the Senate, Canberra, 2012, pp. 446–7, 479–80; Sue Knowles and Vicki Bourne, 'Senate Committees and Legislation', Papers on Parliament, No. 54, Dec. 2010, pp. 39–50. Odgers' Australian Senate Practice, 13th ed., 2012, pp. 575–7; Joint Standing Committee on Treaties, Report 128: Inquiry into the Treaties Ratification Bill 2012, Canberra, 2012, pp. 6–9; Legal and Constitutional Affairs References Committee, Trick or Treaty? Commonwealth Power to Make and Implement Treaties, Canberra, 1995; CPD, 29 June 1994, pp. 2206–7, 31 May 1995, pp. 661–5; Glen Cranwell, 'The Treaty Making Process in Australia', Australian International Law Journal, 2001, pp. 177–196. CPD, 25 March 1999, pp. 3223–5, 31 March 1999, pp. 3634–6, 15 May 2002, pp. 1593–6; Vicki Bourne, 'Digital Television', Australian Law Librarian, Vol. 8, No. 3, 2000, pp. 205–13. CPD, 27 June 2002, pp. 2868–74, 2913. This biography was first published in The Biographical Dictionary of the Australian Senate, Vol. 4, 1983-2002, Department of the Senate, Canberra, 2017, pp. 111-115.